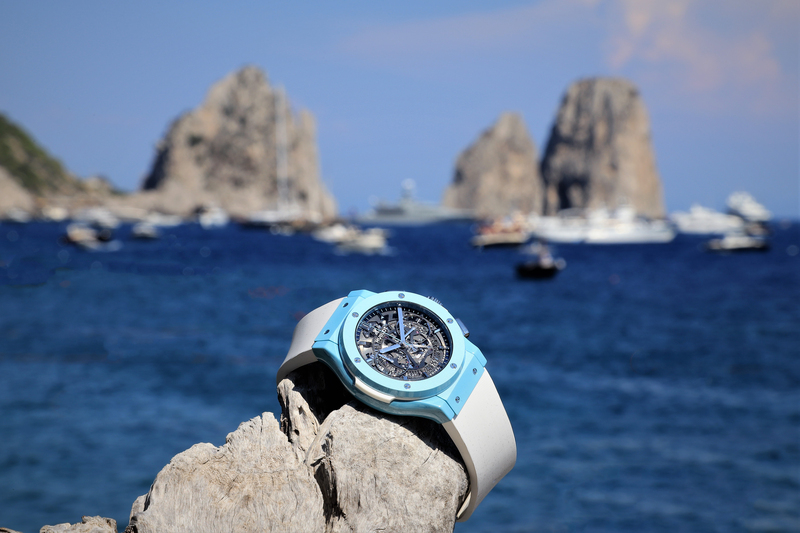 This Summer, Hublot added two new blue models to its collection: the Classic Fusion Aerofusion Chronograph Capri, a tribute to the beautiful Italian Island and its four Faraglioni. 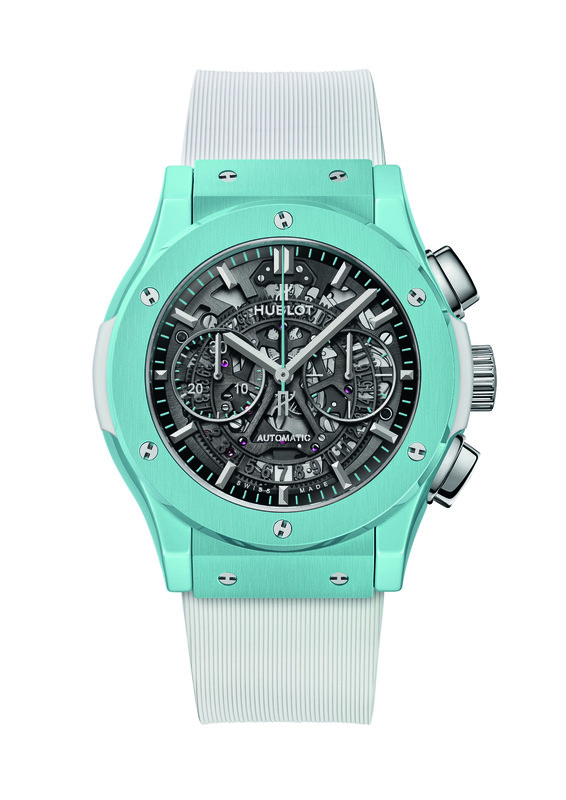 And then there’s the Spirit of Big Bang Blue, which invites you to dream about sunnier climes. Nothing says summer like reminiscences of Italy and the Côte d’Azur. Let’s take a look at the Classic Fusion Aerofusion Chronograph Capri first: The blue, matte ceramic case comes with a diameter of 45 mm. The eclectic, turquoise-blue color is inspired by the waters of the Gulf of Naples and is also used for the second hand which makes its rounds over a skeletonized dial. The case back depicts the Faraglioni. Behind it works the HUB 1155, a automatic movement which provides a power-reserve of 42 hours and works at a frequency of 4 Hz. The Classic Fusion Aerofusion Chronograph Capri will be an ideal compagnon for all journeys southward as well as a beautiful accessory for that holiday look. The Chronograph comes with a white rubber striped trap. It is a limited edition of only 30 pieces. The Spirit of Big Bang Blue also captures summer at its best. This timepiece is a hommage to the distant horizon and the vivid colours of the sea. 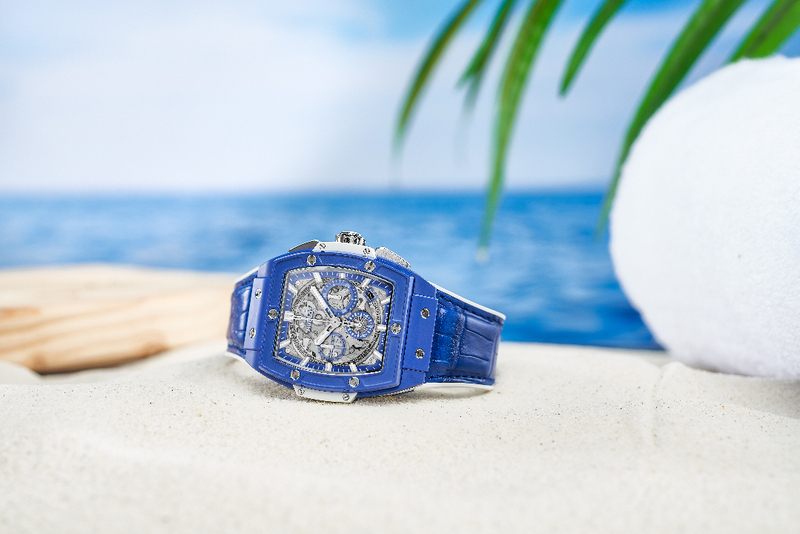 The iconic tonneau-shaped case of this watch is made from azure blue microblasted and polished ceramic. It measures 42 mm in diameter and is water-resistant up to 10 atm. Blue and white accents on the dial round off the skeletonized dial. Inside, the HUB 4700, an automatic skeleton chronograph movement provides the necessary energy. It works at a frequency of 5 Hz and provides a 50-hour power-reserve, while being visible through the sapphire crystal back. 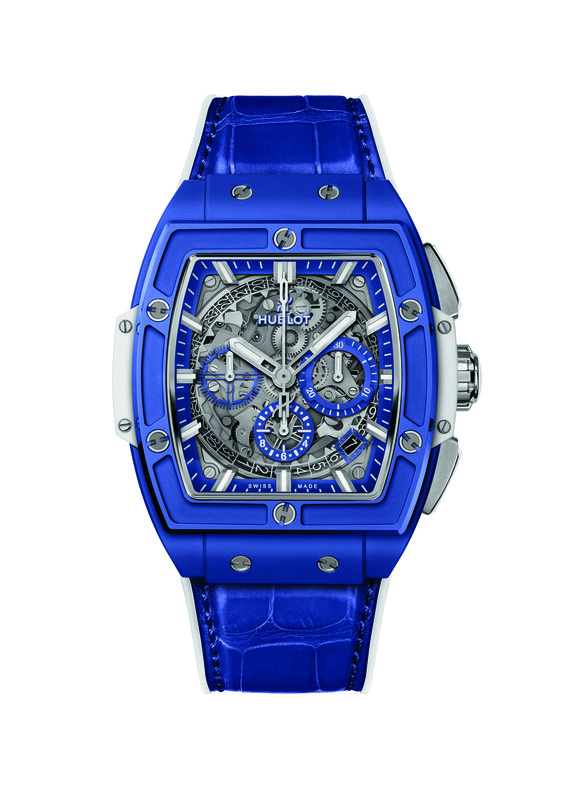 The Spirit of Big Bang Blue comes with a bracelet made from alligator leather, matching the exact hue of blue of the case. This watch is also a limited edition, but with 100 pieces.